The elegant woman in her low-cut satin dress and plumed straw hat sits, incongruously, behind a large canvas propped on a sturdy wooden easel. Fixing us with an intent gaze, she charges a paintbrush from the palette on her arm. Two younger women stand behind her: one seems engrossed in the painting-in-progress; the other looks directly at the viewer, a smile stirring on her lips. When Adélaïde Labille-Guiard exhibited this life-sized Self-Portrait with Two Pupils at the Salon sponsored by the Parisian Royal Academy of Painting and Sculpture in 1785, she was making a daring bid for patronage. Labille-Guiard had always had to find her own way. Even in an era when the Academy permitted four female members, her path to the prestigious body was unusual. Many professional women painters came from families of artists or artisans, but Labille-Guiard was the daughter of a shopkeeper. Her father’s fashionable boutique undoubtedly sharpened her keen eye for fabrics, but provided no entrée to arts institutions. For training and connections, she turned to neighbors, learning first to paint in the traditionally “feminine” media of miniatures and pastels. Later, she studied oil painting with the Academician François-André Vincent, whom she married in 1800. They were already rumored to be lovers when she separated from her first husband in 1779. Unlike aspiring male artists, who could prove their mettle in the Academy’s schools, Labille-Guiard and other women had little choice but to climb the ranks of the art world by participating in exhibitions that operated at the margins of official sanction. 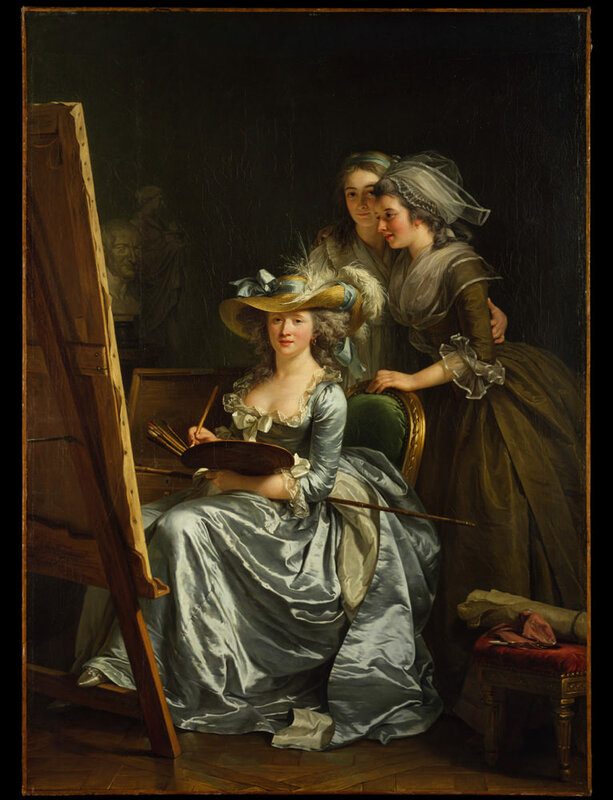 Labille-Guiard first exhibited publicly in 1774, and on May 31, 1783—the same day as her better-known contemporary, Élisabeth Vigée-Lebrun—she was finally admitted to the Academy. The two debuted at the Salon amid a flurry of controversy, and were greeted by a libelous pamphlet filled with sexual and ethical innuendo. Vincent, for instance, was said to have “touched up” Labille-Guiard—referring both to her paintings and her person. Another quip punned that she had 2,000 lovers, because vingt cents (“20 hundreds”) sounds like “Vincent.” Labille-Guiard initiated legal proceedings by appealing to a well-placed patron. “One must expect to have one’s talent ripped apart,” she wrote in a rare extant letter, but “who can plead on behalf of women’s morals?” Within days the offending pamphlets vanished from the shelves. When Labille-Guiard sent the Self-Portrait with Two Pupils to the next Salon, she was taking a calculated risk. Although the painting’s display of her skills and her body transgressed norms of female virtue, its carefully chosen iconography underscored her modesty (a bust of her father is visible in the background, next to a sculpture of a vestal virgin). She won the gamble. The painting attracted the attention and patronage of the king’s aunts, leading in turn to lucrative commissions from his brother and sister. But her timing could hardly have been worse. As revolutionary fervor intensified, her most influential supporters became her biggest liabilities. Never one to be easily discouraged, however, she seized whatever opportunities became available. In 1789, the Academy began debating how to contribute to the regeneration of the nation. Labille-Guiard, the only woman to enter the fray, became a lightning rod for controversy. Of the three factions that emerged, two stood opposed on almost every point: the traditionalists, who hoped to maintain the Academy’s royal title and rigid hierarchy, faced off against Jacques-Louis David and his coterie, who wanted to end hierarchical distinctions and royal interference. On one matter, though, the antagonists were in near agreement: female membership should be limited, at best. The traditionalists hoped to maintain the existing cap of four, but David’s “Commune” banned women completely, declaring female modesty incompatible with the “long and hard study” of art. Only the third group, the reform-minded Central Academy, adopted Labille-Guiard’s proposal that unlimited numbers of women be admitted. “Every honest woman who is a true artist is a man for the Academy,” they insisted. In the end, the post-revolutionary successor to the Academy admitted no women. Politically, Labille-Guiard cast her lot with another group of moderate reformers, with the same disastrous results. At the 1791 Salon, she exhibited portraits of 14 deputies to the National Convention, 13 of whom were members of the Feuillants—a party that advocated constitutional monarchy. But that was not to be. In 1793 and 1794, many of Labille-Guiard’s sitters, including several Feuillants and the king’s sister, not to mention Louis XVI himself, were carted to the guillotine. On August 11, 1793, an order from the Directory of the Department of Paris required Labille-Guiard to hand over an enormous group portrait, commissioned by the king’s brother, to be burned in a public bonfire. Labille-Guiard waited out the Reign of Terror in a countryside refuge shared with Vincent and her student Marie Gabrielle Capet (seen at far right), among others. She returned to a dramatically altered Paris in 1795, and painted a handful of exquisite portraits in her final years, before dying after a long illness. Perhaps the suffering had begun much earlier, when her paintings—and her ideals—were incinerated in the name of regeneration. Laura Auricchio ’90, assistant professor of art history at Parsons The New School for Design, is author of the just-published Adélaïde Labille-Guiard: Artist in the Age of Revolution, the first study in English of the artist.